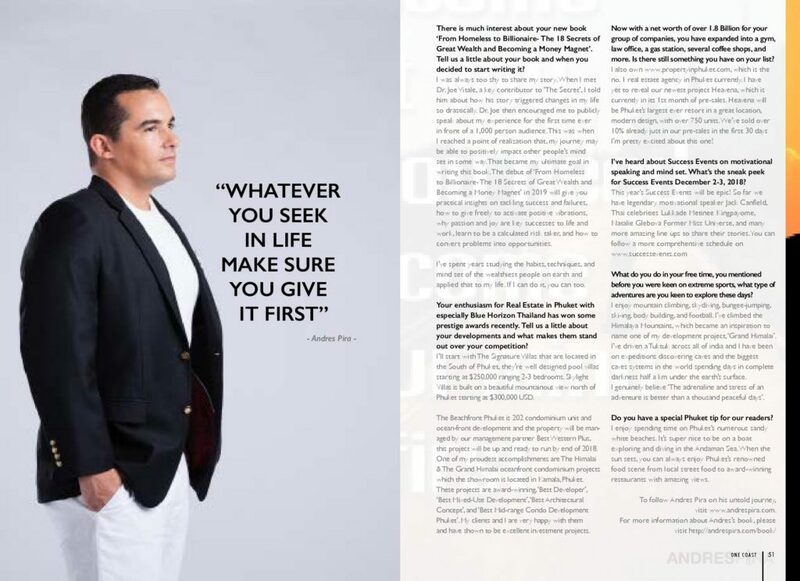 This edition of One Coast magazine meets with Serial Entrepreneur and Real Estate Tycoon Andres Pira. Here’s how the story unfolds: Andres was originally from Sweden and left for Thailand at the tender age of 20. Lusting to live in a tropical country, a $2,000 inheritance from his grandfather bought him a one-way ticket to Thailand. After arriving in Bangkok and traveling to Phuket, it wasn’t long before Andres was down to his last $100. He was evicted from his little apartment and sleeping hungry on the beach. Far from home and embarrassed to ask his immediate family for help, in desperation and hunger he phoned a friend. The friend answered, “I won’t give you any money, but I’ll give you a book that might help you”. Frustrated and upset from the response, Andres eventually read the book ‘The Secret’ while sitting on the beach. From that moment on, his life has completely changed with ‘The Law of Attraction’. Far from home and embarrassed to ask his immediate family for help, in desperation and hunger he phoned a friend. The friend answered, “I won’t give you any money, but I’ll give you a book that might help you”. 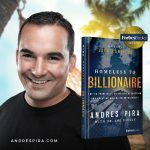 Frustrated and upset from the response, Andres eventually read the book ‘The Secret’ while sitting on the beach. From that moment on, his life has completely changed with ‘The Law of Attraction’. The story unfolds below. 1: Andres, Thailand is not a sweet country if you’ve no financial means. You must have been close to giving up being both hungry and sleeping on the beach. What was it in the book that gave you the motivation to carry on? A: With no contacts, jobs, or knowledge of Thai language, I did realize quick after I got to Phuket that life wasn’t going to be a paradise I had hoped for. The book taught me visualization and the power of mind manifestation. Looking back, this was one of my worst and best moments of my life. 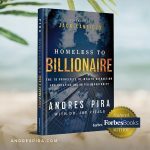 2: What did you first do after reading the book what started you on your road to success? A: I tried to visualize someone giving me something to eat. The next day, I bumped into an old colleague which offered me a free lunch. I was like, ‘wow, this works’. So, I became determined to get a job within the next week. My first job was as a marketing executive handing out brochures for a real estate developer. Within 1 year, I was promoted to a sales agent, then sales manager, and finally sales director. By year 3, I excelled in real estate sales and had harvested several property investors who believed in my vision and ambitions. This led to my first investor funded Phuket property development company, Blue Horizon Thailand. 3: Why did you choose Thailand in the first place? A: Honestly, the ticketing agent recommended it out to me, saying it was a destination I could afford with the money I had. 4: How long have you had Blue Horizon? A: Blue Horizon Developments was established over 15 years ago. We now currently employ a team of 249 employees and growing. In June 2017, Blue Horizon Developments was named ‘Top Thai Property Developer’ and Best New Hotel Construction & Design’ by Asia Pacific Property Awards 2017-2018. In July 2017, Blue Horizon Developments collected 3 awards, ‘Best Developer’, ‘Best Mixed-Use Development’, and ‘Best Mid-range Condo Development Phuket’ for their B850 million Grand Himalai Project at the inaugural awards ceremony by Thailand Property and Dot Property Group. Blue Horizon’s group of portfolio includes award-winning The Beachfront, award-winning Skylight Villas, Signature Villas, and Himalai Oceanfront Condominium. We’re nominated again in 2018 as well! 5: Who’s the most inspiring mentor in your life? A: My mother. She was a strong woman of 4 amazing children, the only person who had always believed and encouraged me to be the best I could be and always keep chasing my dreams. Her words gave me strength. She recently lost her battle to cancer and will always be in my heart. In terms of mindset and helping me become a law of attraction master I would say, Authors like William walker Atkinson, Charles Haanel, Joe Vitale and Napoleon Hill. 6: Once you were on the road to success you have still mostly stayed and expanded your businesses in Thailand, what is it with this country that even after first almost desperation and homelessness then slowly building yourself up to now that still keeps you here. Surely you must have considered expanding to other countries? A: With year-long sunny weather, amazing Thai dishes, and the culture, this is exactly the life I had dreamt of. Right now Thailand is a touristic hub and the real estate market is booming. I’d like to focus on developments in Thailand for few more years before expanding to overseas destination. Hey, you never know what good opportunities are around the corner. 7: People meeting you and those I’ve met that work for you explain they feel inspired from you but where would you say your motivation and enthusiasm for life come from? A: The energy of being around great, forward-thinking people is what keeps me going. I surround myself with people who are constantly evolving, creating, and executing. It’s these awesome signs of progress that keep me challenging and motivating myself. I make sure to hire people that are smarter than me. 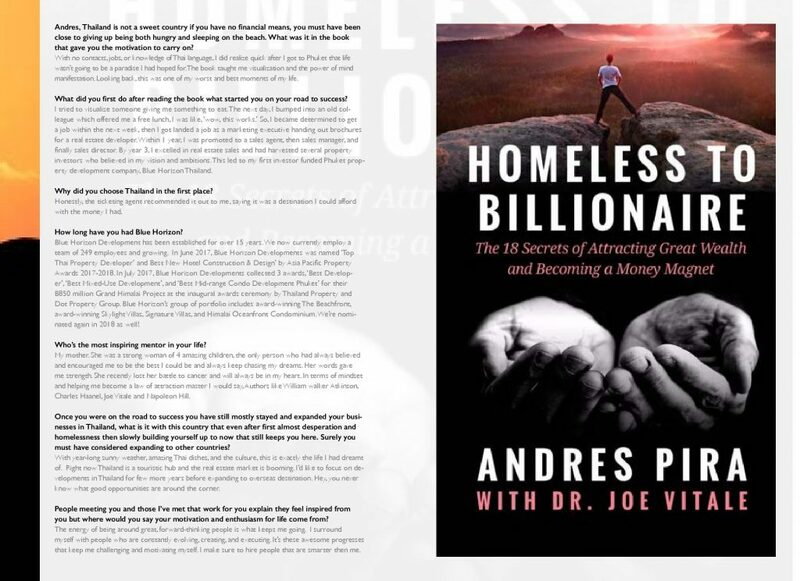 8: There is much interest in your new book ‘From Homeless to Billionaire- The 18 Principles of Wealth Attraction and Creating Unlimited Opportunity’. Tell us a little about your book and when you decided to start writing it? A: I was always too shy to share my story. 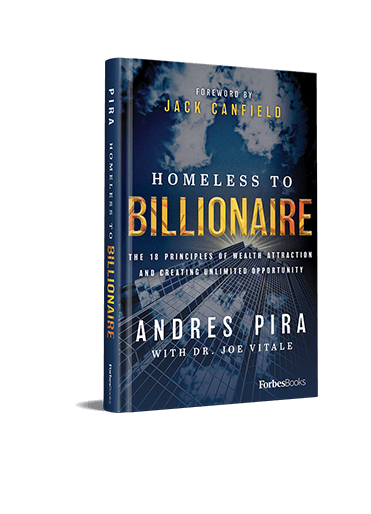 When I met Dr. Joe Vitale, a key contributor to ‘The Secret’, I told him about how his story triggered changes in my life so drastically. Dr. Joe then encouraged me to publicly speak about my experience for the first time ever in front of a 1,000 person audience. This was when I reached a point of realization that, my journey may be able to positively impact other people’s mind set in some way. That became my ultimate goal in writing this book. 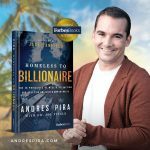 The debut of ‘From Homeless to Billionaire- The 18 Principles of Wealth Attraction and Creating Unlimited Opportunity’ in 2019 will give you practical insights on tackling success and failures, how to give freely to activate positive vibrations, why passion and joy are key successes to life and work, learn to be a calculated risk taker, and how to convert problems into opportunities. 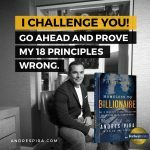 I’ve spent years studying the habits, techniques, and mind set of the wealthiest people on earth and applied that to my life. If I can do it, you can too. 9: Your enthusiasm for Real Estate in Phuket with especially Blue Horizon Thailand has won some prestige awards recently. Tell us a little about your developments and what makes them stand out over your competition? A: I’ll start with The Signature Villas that are located in the South of Phuket, they’re well designed pool villas starting at $250,000 ranging 2-3 bedrooms. Skylight Villas is built on a beautiful mountainous view north of Phuket starting at $300,000 USD. The Beachfront Phuket is 202 condominium unit and ocean-front development and the property will be managed by our management partner Best Western Plus, this project will be up and ready to run by end of 2018. One of my proudest accomplishments are The Himalai & The Grand Himalai oceanfront condominium projects which the showroom is located in Kamala, Phuket. These projects are award-winning , ‘Best Developer’, ‘Best Mixed-Use Development’, ‘Best Architectural Concept’, and ‘Best Mid-range Condo Development Phuket’. My clients and I are very happy with them and have shown to be excellent investment projects. 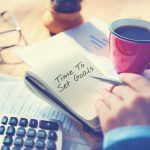 10: Now with a net worth of over 1.8 Billion for your group of companies, you have expanded into a gym, law office, a gas station, several coffee shops, and more. Is there still something you have on your list? A: I also own www.propertyinphuket.com, which is the no. 1 real estate agency in Phuket currently. I have yet to reveal our newest project Heavena, which is currently in its 1st month of pre-sales. Heavena will be Phuket’s largest ever resort in a great location, modern design, with over 750 units. We’ve sold over 10% already just in our pre-sales in the first 30 days I’m pretty excited about this one! 11: I’ve heard about Success Events on motivational speaking and mind set. What’s the sneak peek for Success Events December 2-3, 2018? A: This year’s Success Events will be epic! So far we have legendary motivational speaker Jack Canfield, Thai celebrities Lukkade Metinee Kingpayome, Natalie Glebova Former Miss Universe, and many more amazing line ups to share their stories. You can follow a more comprehensive schedule on www.successevents.com. 12: What do you do in your free time? You mentioned before you were keen on extreme sports, what type of adventures are you keen to explore these days? A: I enjoy mountain climbing, skydiving, bungee-jumping, ski-ing, body building, and football. I’ve climbed the Himalaya Mountains, which became an inspiration to name one of my development project, ‘Grand Himalai’. I’ve driven a Tuktuk across all of india and I have been on expeditions discovering caves and the biggest caves systems in the world spending days in complete darkness half a km under the earth surface. I genuinely believe ‘The adrenaline and stress of an adventure is better than a thousand peaceful days’. 13: Do you have a special Phuket tip for our readers? A: I enjoy spending time on Phuket’s numerous sandy white beaches. It’s super nice to be on a boat exploring and diving in the Andaman Sea. When the sun sets, you can always enjoy Phuket’s renowned food scene from local street food to award-winning restaurants with amazing views.